“There are never enough hours in the day.” A phrase I seem to live by these days, as would most I would imagine. I’m sure that if you are reading this then you have likely uttered the phrase yourself. We have all had one of those jobs or tasks that seems insurmountable, with many factors that dictate that no matter what you do, you will never quite get to empty that plate before another fills up. This daunting feeling of having things on top of other things makes me wonder why farmimg and life- sim games gain the popularity that they do. These games essentially replicate that working week, compounding mundane activities such as farming or architecture into gamified busywork. Typically, after doing a day of work, playing a game in which, you work to a schedule and are mandated to socialise with people isn’t on my list of sought-after experiences, So why the score? 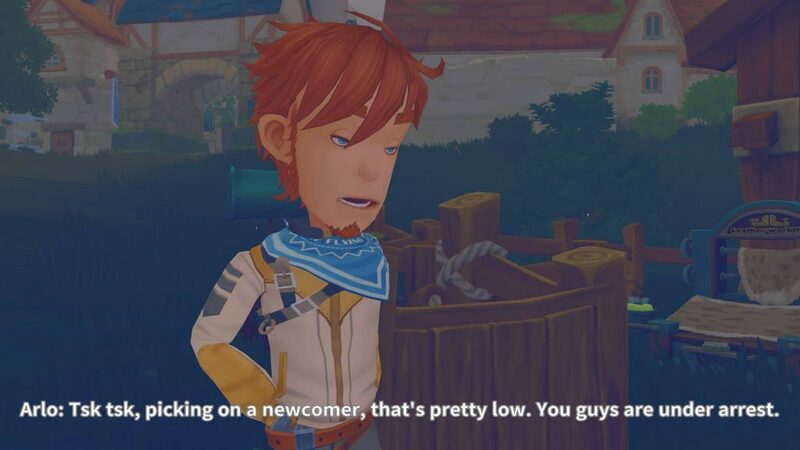 My Time At Portia definitely fits into all of the above. It takes all of the usual elements of a farming /life simulator, while replicating the often-trodden survival crafting games that have been all the rage in this generation. However, what is maybe not immediately apparent, is the notion that it is not a game about spinning plates, which so many of its peers are. For example, like other games of this ilk, there are weekly or seasonal events to take part in. These don’t feel mandatory and villagers won’t think less of you for not joining in, the worst thing that will happen is that you miss out on some reputation points. Choosing to build a commission or go on an adventure is not a black or white choice either, allowing you to make the call depending on what you fancy doing from day to day with no fear of failing on your mortgage, losing friends or hard-earned cash. 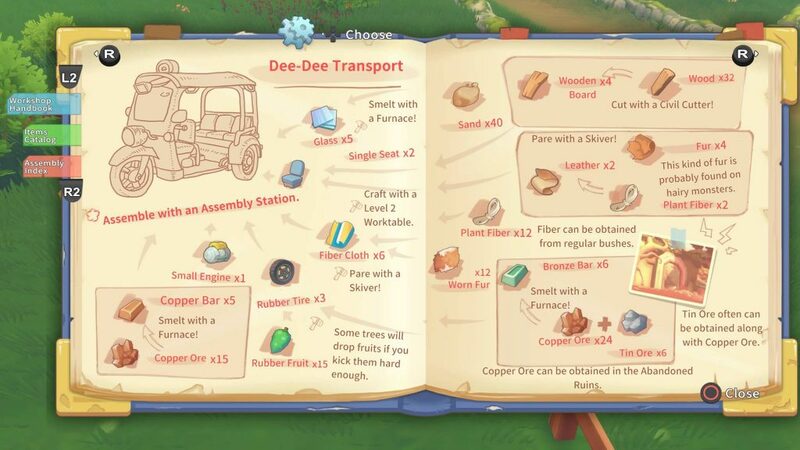 The setup for My Time At Portia follows a familiar template. You arrive by boat to the small island town of Portia, where a dilapidated workshop, previously owned by your father lies in state, waiting for suitable upkeep. It is up to the player to work to fix up the workshop by taking gradual commissions from the locals and integrate into the small-town society. From the off, it’s clear that the stakes are low, besides a rivalry with the other local workshops who all compete for commissions that earn them reputation and money. The main key to the game however, is building up the world around you and the main meat of the storyline follows this endeavour. While the game starts off slow, it does a good job of keeping the carrot in front of your face regarding larger projects that require multiple stages and approaches to be able to craft them. At first it can all seem quite daunting. Early in the game you are tasked with creating a bridge that crosses a gap in the river from the main island to a smaller one. To be able to do so, you need to work through a laundry list of tools and materials that you need to be able to craft it together. Some require standard gathering nodes such as trees for wood and rocks for stone, while others require you to venture deep into cave systems to spelunk relics from the past. The tools you craft include furnaces, cutting saws and skivers that take the materials you find and transform them into useable elements for your large build assembly station. It takes a while to begin with, but of course this can be expedited by creating more of an assembly line of machines so you can keep more processes in action as you progress. Once you create a rhythm of production, it becomes easier to venture away, should the story be your main calling. These are just a couple examples of gaining the materials you need for builds. Other ways include venturing into dungeons, treating the townsfolk to gifts and occasional festivals which see the town being lavished with gifts on the 19th of each month. The dungeons in particular were something that took me by surprise, Portia has a relatively robust combat system that mimic the likes of Fable. It’s quite simplistic and won’t win awards for its amazing combo mechanics or flare, but it certainly does the trick when the alternative action in game is working out whether to craft your bronze bars into pipes or slabs. That is not to say that the bronze bar scenario is a detriment, in fact piecing together the jigsaw that is the large builds becomes a fun minigame in its own right, especially when you are able to plan a project to be completed within your own time limit. This is all helped by the overarching style of the game. The town of Portia and its surrounding provinces is wonderful to behold. The Ghibli-esque visuals and quirks make exploration something worth doing and the townsfolk are quaint with a lot of personality. This is where i would give Pathea the most amount of credit. They have managed to craft a land and characters that make me feel that i want to get to know, this flies in the face of other games of a similar ilk for me. All too often, town characters in life-sims are merely just walking noticeboards where you need to read them daily to get the daily trinket to help you along the way. 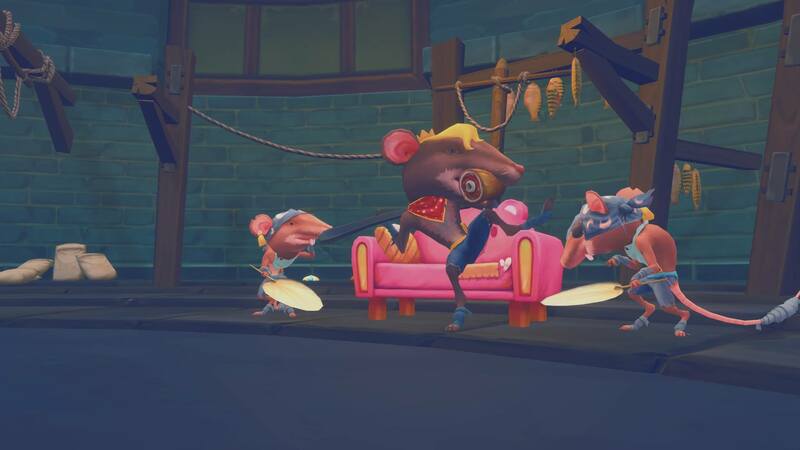 In Portia, these guys have daily routines, motivations and offer opportunities beyond giving gifts or buttering them up by noticing them. Each town member offers the player a benefit of some kind and getting to know them feels organic and not in a nagging way. I especially love the fact that you can spar with anyone in town, which is a good way of gaining affection or a few gold when the iron is cooking. They aren’t all nicey-nice either. 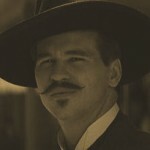 A couple of characters you meet early on in fact are criminals who are looking to extort cash out of anyone and steal their belongings, making it worthwhile to keep the law on your side by befriending civil corps members. Another key to the enjoyment of the game is within customisation. At first it may seem that the only way to build upon your Portia life is by enhancing your workshop and making it more efficient. But in reality, just about everything can be tweaked to your liking. Furnishing your house has a purpose beyond simply building a habitat. Each furniture item built or bought adds to your base stats, making you more proficient in crafting or combat. Building relationships with the townsfolk yield benefits such as regular materials being gathered for you to ease the busywork or enable companionship when tending to livestock or battling through dungeons. It’s the best element of the game for me as tinkering with every minute detail allowed me to pick up on the shortfalls, I had with other aspects of the game that I didn’t necessarily enjoy such as constant resource gathering and let me focus on elements I did like, such as combat and exploration. This was quite refreshing as all too often with games like these, they give you the illusion of freedom to choose, but take that away from you when they push an errand in your face that just completely takes over. For me, this elevates Portia over most sim games i have tried. There is no single gameplay element that could stand alone as a high tier example in its own right. The game takes a jack of all trades approach, mixing many elements as opposed to relying on one and letting the rest of the game suffer. It comes together beautifully and creates a solid, relaxing adventure. The only things truly letting down the experience were some nuances, such stiff movement and the repetitive music that exhibited occasional bugs where it would forget which song was supposed to play at a certain time. However, considering how much else is going on in My Time At Portia and the small team at Pathea, this is still one hell of an achievement from a small team and there are lots to like about what remains. 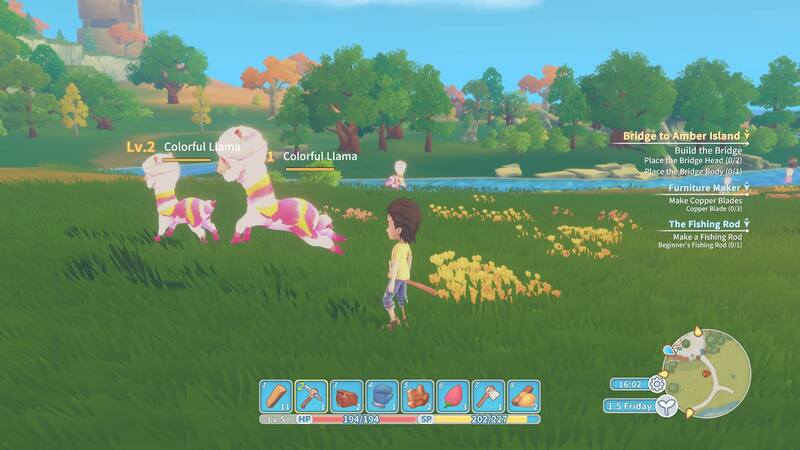 Barring a few janky moments, My Time At Portia remains an engrossing, vibrantly colourful Sim-RPG with tons of charm, surprises and discoveries around each corner. There is plenty to see, lots to do and a fair amount to love about this charming and rewarding adventure.